Location of the West Coast. The West Coast is one of the administrative regions of New Zealand, located on the west coast of the South Island, and is one of the more remote and most sparsely populated areas of the country. It is made up of three districts: Buller, Grey and Westland. 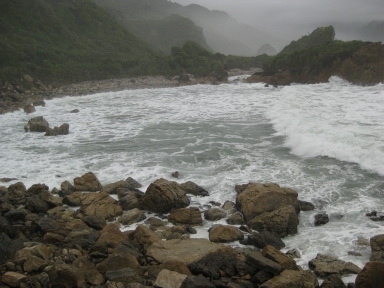 The principal towns are Westport, Greymouth and Hokitika. * To New Zealanders, 'The Coast' generally refers to the West Coast of the South Island, and 'Coasters' to those that live there. * 'Westland' is used by some New Zealanders to refer to the whole of the West Coast, including Grey District, Buller District, and Fiordland. * Fiordland is geographically on the west coast of New Zealand but has no road connection, and is in the Southland rather than West Coast administrative region. A map showing population density in the West Coast Region at the 2006 census. 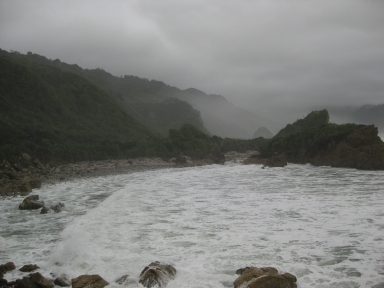 The West Coast region reaches from Kahurangi Point in the north to Awarua Point in the south, a distance of 600 km. 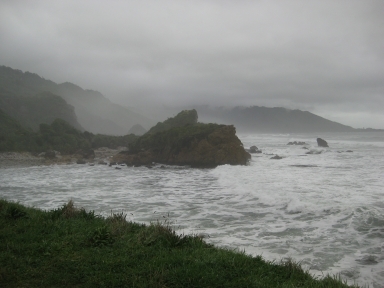 To the west is the Tasman Sea (which like the Southern Ocean is known to be very rough, with 4 metre swells being common), and to the east are the Southern Alps. 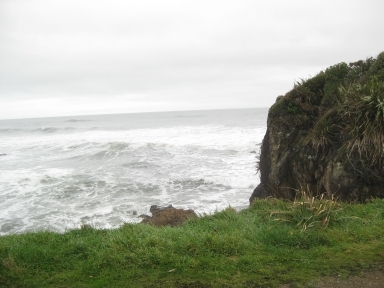 Much of the land is rugged, although there are coastal plains around which much of the population resides. The land is very scenic, with wild coastlines, mountains, and a very high proportion of native bush, much of it native temperate rain forest. The West Coast is the only part of New Zealand where significant tracts of lowland forest remain-elsewhere, for instance on the Canterbury Plains and in the Firth of Thames, they have been almost completely destroyed for settlement and agriculture. 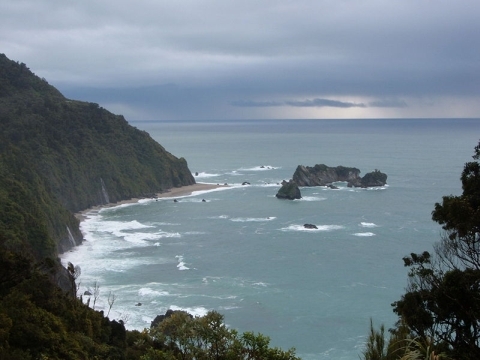 Scenic areas include the Haast Pass, Fox and Franz Josef Glaciers, the Pancake Rocks at Punakaiki and the Heaphy Track. The region has a very high rainfall due to the prevailing northwesterly wind pattern and the location of the Southern Alps - these two elements give rise to heavy orographic precipitation. The flip side to this is the rain shadow effect which is responsible for the relatively arid climate of the Canterbury Plains on the other side of the Southern Alps. The region's area is 23,000 km². It is divided into the three districts of Buller, Grey and Westland. The West Coast was home to Maori, who valued it for the taonga of greenstone (pounamu) which was found there in abundance. 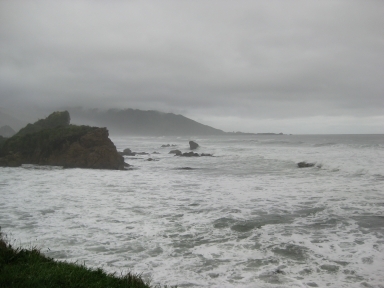 The West Coast was only occasionally visited by early Europeans until the discovery of gold near the Taramakau River in 1864 by two Maori, Ihaia Tainui and Haimona Taukau. By the end of the year there were an estimated 1800 prospectors on the West Coast, many of them around the Hokitika area, which, in 1866, became briefly the most populous settlement in New Zealand. 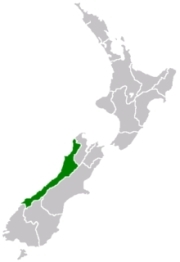 The present-day region of the West Coast was divided between Nelson Province and Canterbury Province from 1853, but in 1873 the Canterbury portion of the region formed its own province, the Westland Province, until the abolition of the provincial system in 1876. A major goldrush took place between 1864 and 1867 creating numerous gold rush towns such as Okarito which became the one time largest town on the West Coast but then quickly almost vanished as miners moved on. After that time, the population dwindled, but the main towns that still exist on the coast had become established. Following pounamu and gold, the next mineral to make the West Coast valuable was coal. Discovered near the Buller River in the mid 1840s, mining began in earnest during the 1860s. By the 1880s, coal had become the region’s main industry, with mines throughout the northern half of the region, especially around Westport. Many of these continued in operation until the mid 20th century, and several survive today. Timber has also long been a major industry in the region, although in recent years there has been an uneasy balance between forestry for wood and forestry for conservation. Much of the region is public land administered by the New Zealand Department of Conservation and the region has some of the best remaining stands of native forest, along with a wealth of rare wildlife. Ecotourism is now one of the industries for the region, and this goes hand in hand with the conservation efforts. The region is sparsely populated, especially in the south, with the 2006 census recording 31,326 inhabitants, up from 30,303 in 2001, although not as high as the 1996 figure. 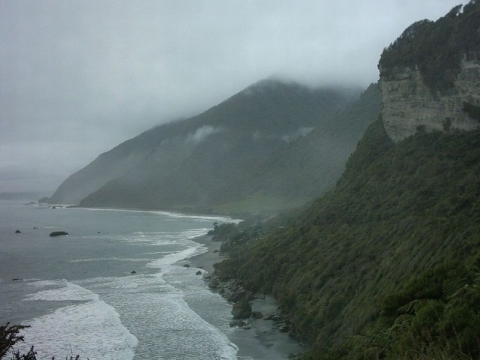 Major towns on the West Coast are Greymouth, Westport, and Hokitika. 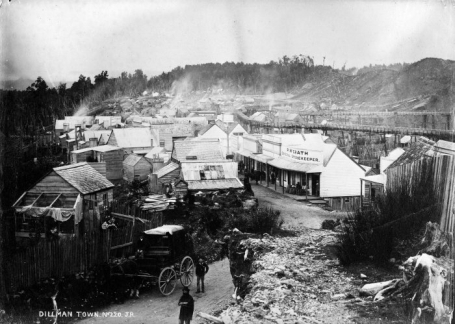 At one time, during the gold rush days, Hokitika had a population of more than 25,000 and boasted more than 100 pubs. A recreation of an early New Zealand settlement can be found at Shantytown. Industries on the West Coast include mining for coal and alluvial gold, forestry and wood processing, and also fishing (including whitebaiting), tourism and farming. Dairy farming has grown strongly - the local dairy co-operative Westland Milk Products remained independent when most others merged to form Fonterra in 2001. Other industries are the manufacturing and sales of greenstone jewellery, sphagnum moss gathering and stone-collection for garden landscaping. The West Coast also has one of the strongest growing regional economies of New Zealand, as of 2007, though from a rather small base. The West Coast has been numbered amongst the "Top 10 Coastal Drives of the World" by Lonely Planet. The West Coast is also famous for being the only New Zealand nesting place of the rare White Heron / Kotuku, which nests near the Okarito Lagoon and can be visited from tours operating out of the small farming township of Whataroa. This rare bird appears on the New Zealand $2 coin.